A guidebook to help young farmers and ranchers navigate the credit options offered by the Farm Service Agency. This is the first comprehensive plain language guide to FSA loans since before the introduction of the popular microloan in 2013. Farm Service Agency Loans: The Ins and Outs of Growing a Farm with Federal Loans is written for farmers and ranchers who want to access low interest federal credit options that are aimed at family farmers. 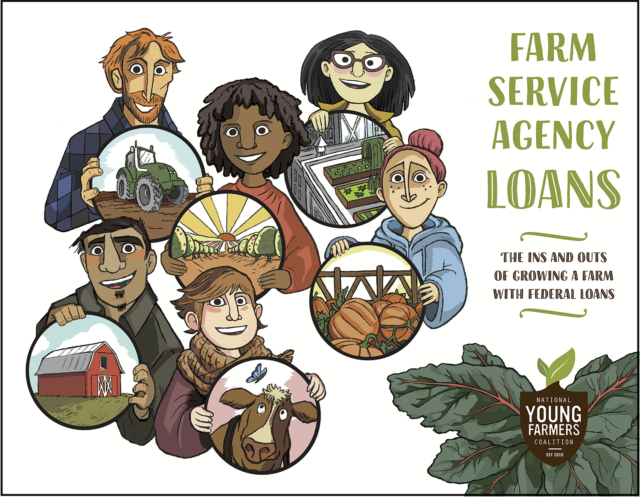 NYFC has worked with FSA to improve loan options for the young farmers who sometimes struggle to access credit. A historical number of young farmers are accessing microloans, yet 30% of young famers who took our 2017 National Young Farmer Survey reported that they were unfamiliar with federal programs. With this guide, we hope to help those farmers understand their options.